Process improvement projects are important and help solve critical business issues. However, world-class process performance is achieved through continuous improvement, and not just by fixing processes that periodically break down. In Phase 4: Process Management, the individual process is managed for optimal performance on a continuing basis. The input to Phase 4 is an improved process from Phase 3 or a healthy process from Phase 0 (a process that does not require major improvement right now, but requires management attention to remain healthy). Clarify management roles and responsibilities—process owners and process management teams are identified. Track process performance—if you are arriving at Phase 4 from Phase 3, measures were designed in Phase 2 and installed as a measurement system in Phase 3. If you are arriving at Phase 4 from Phase 0, a first step in process management is to make sure you have a good measurement system in place, one with linked measures at the Three Levels of Performance. Plan, support, and manage process performance—information from the performance management system is analyzed and corrective action taken when appropriate. 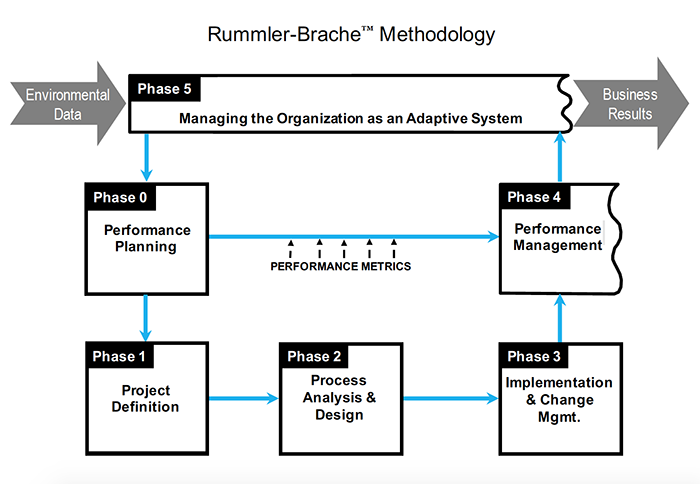 The outputs of Phase 4: Performance Management are optimized processes. © Copyright Rummler-Brache Group. All Rights Reserved. Register only once to access this document and all the free premium content, articles, and tools on Rummlerbrache.com. A valid e-mail business address. Gmail, Hotmail, Yahoo, AOL, and other personal email addresses will not be accepted. A business email address is required for access to the free materials on Rummlerbrache.com. Login instructions will be sent to your email address. Register only once to access this tool and all the free premium content, articles, and tools on Rummlerbrache.com.